At this market, a long time ago, a crowd of people could buy fresh vegetables and very fresh fish. But like most markets in town, it couldn’t compete with the big supermarkets, where the products are not so organic, not so fresh, but…much cheaper. So the market was dying a slow death, with less and less stalls, until a couple of years ago, when they finally decided to go modern. Now there isn’t a night where the market isn’t fully packed with thirty and forty-something people that obviously didn’t have a place of their own until now. (The younger generation has Bairro Alto). The market has a huge range of restaurants and ‘bistros”. There is a place to eat a piece of meat of your choosing (Atalho), another one for seafood, burgers, sushi, Portuguese traditional pastries…And to drink it goes from wine to champagne and a bar whose speciality is fantastic gin tonics, along with a nice explanation while making your drink. This food corners keep swapping, I guess in an attempt to give all restaurants a chance to be in the market. Fortunately, the changes have been good until now. 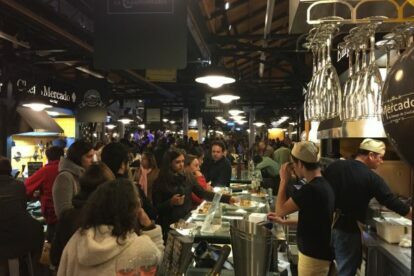 This market was conceived as a gourmet experience, although I mostly go there to drink with friends. Still, a very good rebirth of the market, and by the way, it’s still a place where you can buy fresh vegetables, fish and meat. They offer live music performances some nights, making those nights my favorite.